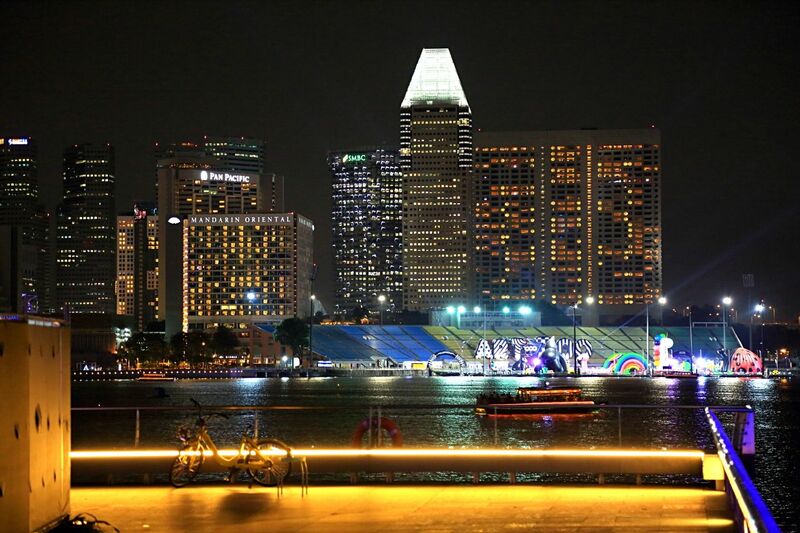 From the completion of land reclamation in 1992, Marina Bay has grown and developed into Singapore’s iconic skyline. With skyscrapers, heritage buildings and a spectacular water-show lined along the Waterfront Promenade, there is no lack of personality in the well executed Masterplan from URA. Members of ligthing detectives held Singapore’s first night walk to hunt for the heroes and villains of light in Marina bay as well as peeking into the current iLight installations along the way. 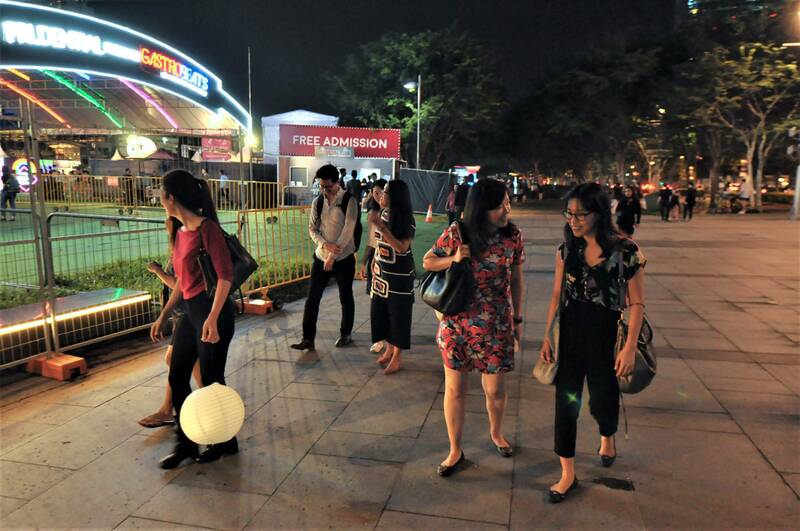 Singapore just held their first Lighting Detectives Night Walk with the theme of Urban Nightscape and it was opened to members of the public. 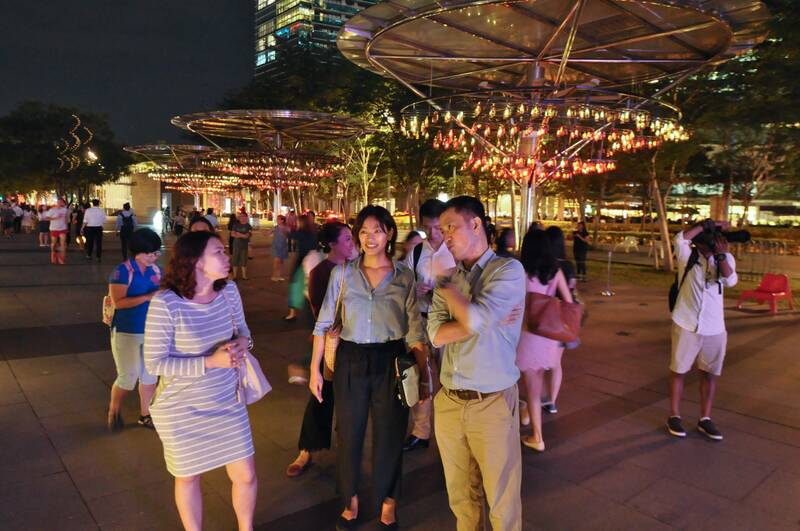 There were 18 people that turned up at the meeting spot Rain Oculus at Marina Bay Sands on the 28th March 2018, 1900h. We started our walk slightly late while waiting for the heavy rain to subside and started the self-introductions as well as Lighting Detectives on the international stage. 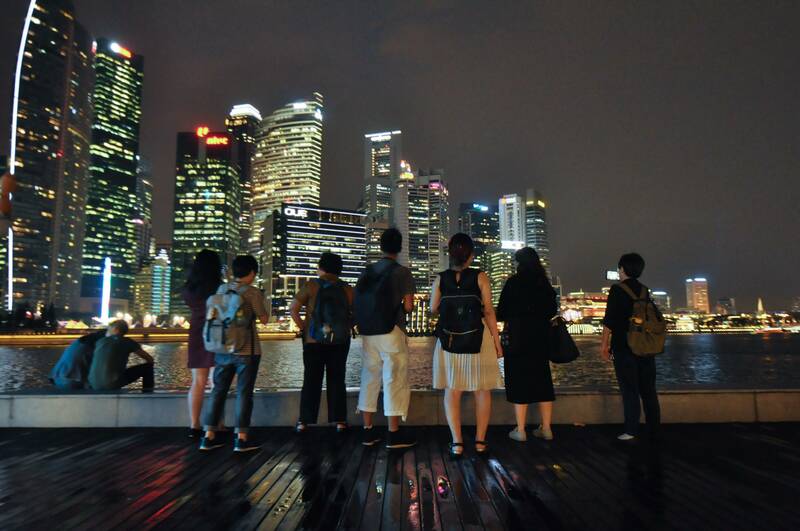 Our first foray as Heroes and Villains was to look at the Financial centre together with Fullerton Promenade as a macro perspective. 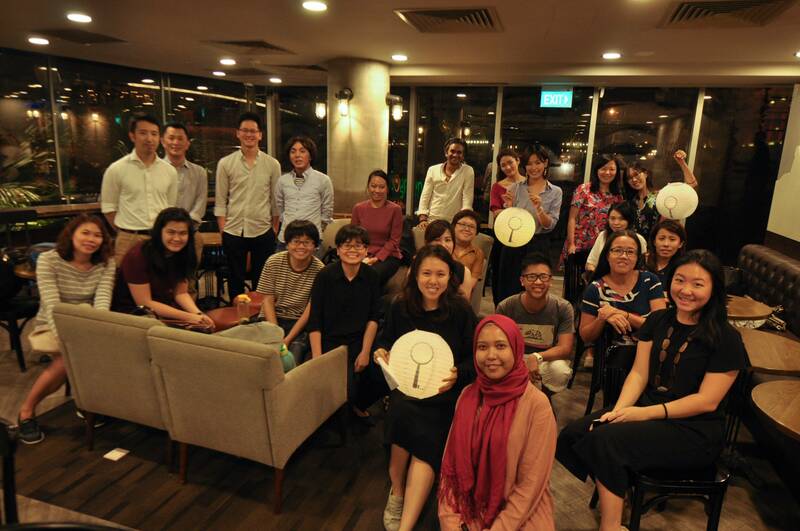 Most of the participants did not come from design backgrounds but they had great insight and interest in the design of the environment and its lighting. We began by examining lighting fixtures such as footlights along the promenade and pole lights. We discussed whether these lights were providing pleasant and suitable brightness to the area. With further deliberation, we were able to differentiate indirect and direct lighting and what lighting methods could have been used to make this area better. We also discovered a general maintenance issue that led to different colour temperatures with consecutive streetlamps. 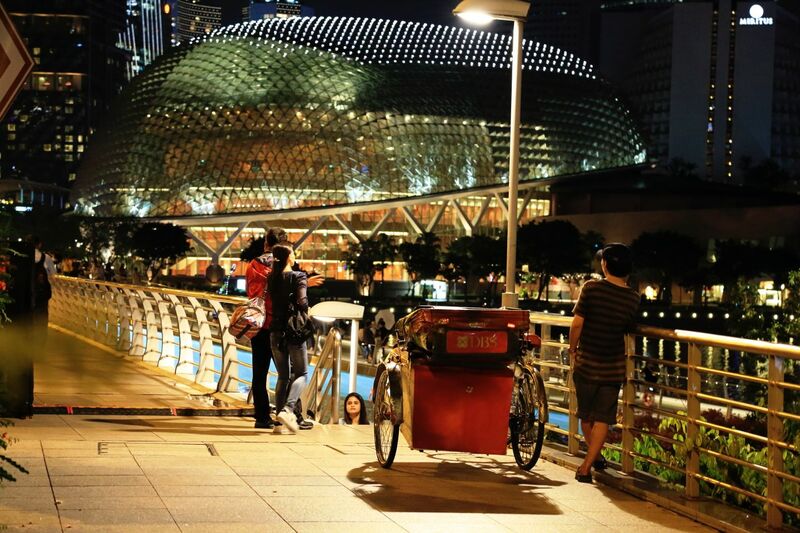 Singapore has a lighting masterplan for Marina Bay and there are regulations that buildings have to adhere to. We found discrepancies between the guidelines and what was actually built. However, we concluded that Singapore nightscape has evolved well according to the big picture and realised how necessary it is to have a plan. By end of the night walk, we sat down to consolidate our findings and shared our different perspectives. Participants were passionate about examining lighting environment and keen to join our future walks. iLight 2018 was also on, giving us a more vibrant walk to what was an everyday scene. Facade light creates direct glare when we see from the side. We liked the general area of Marina Bay Sands and many Hero pictures came from there. 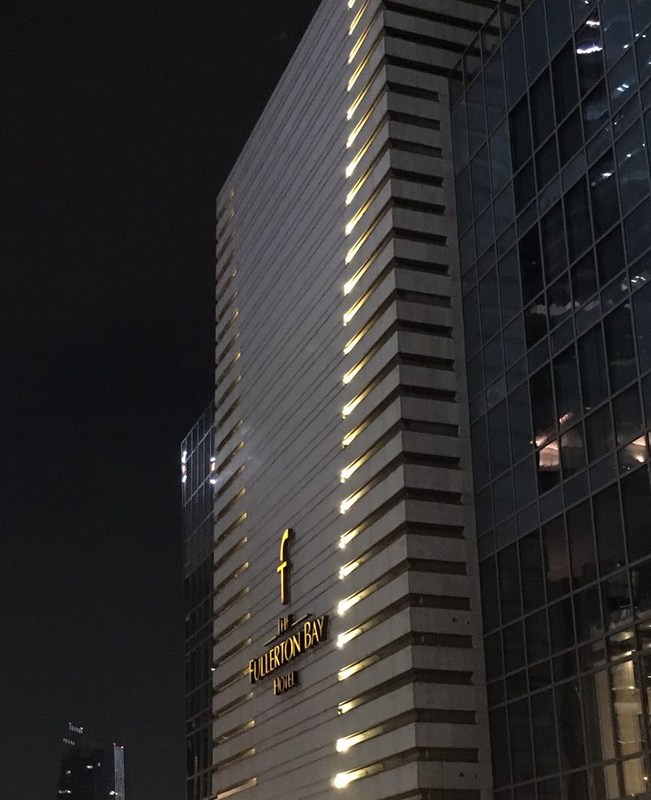 Our team was very passionate about the iLight installations and how the big red heart looked like a Villain but after realizing that it synchronises with the projection on Fullerton Hotel, our opinion of it changed to Hero. 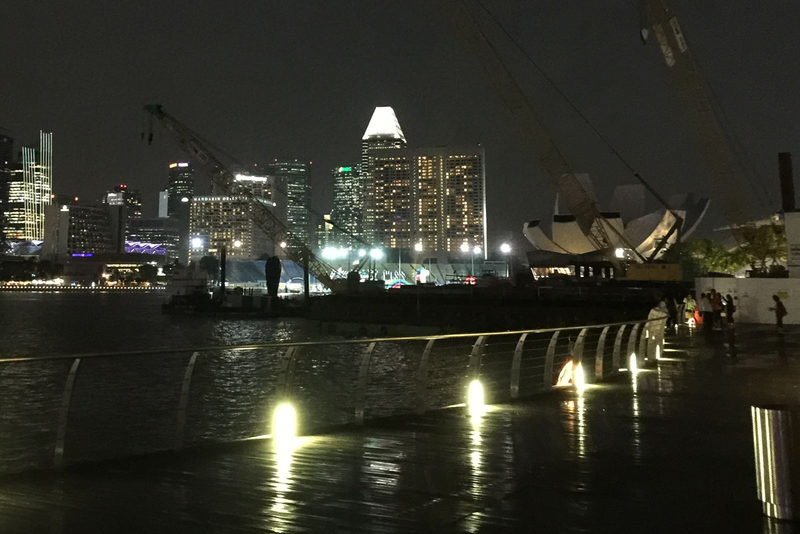 We liked the dotted lights lining the waterfront promenade at Fullerton area and thought that it was better than the continuous linear lighting at the CBD side itself as it makes a nicer reflection on the water. There was a carnival along the promenade which we felt that it contributes to much light pollution and glare, but it also made nice komorebi effect on walls of the buildings that were near to trees. We had fun and learnt about Marina Bay masterplan as well! 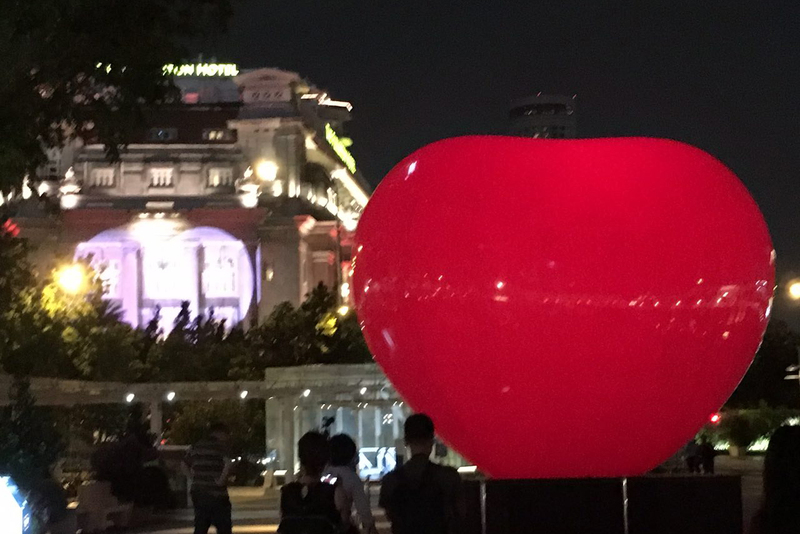 Big heart installation as well as projection to the fullerton hotel facade. Nostalgic rickshaw toward the iconic building, Esplanade theatre on the bay. Glary footlights along the bay which have reflection on the deck wet by rain water. 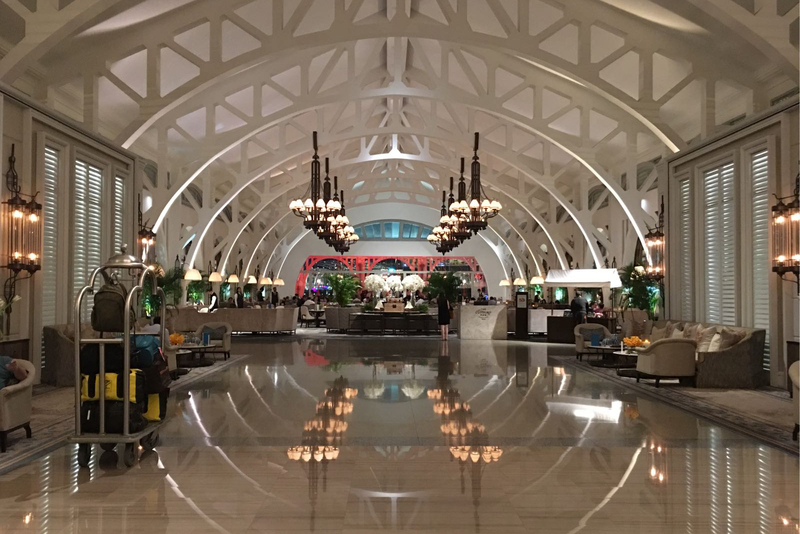 Our team had a discussion about building and lighting design of Marina Bay Sands hotel. Although it is saying the design was inspired by decks of cards officially, we thought it looks like a ship floating on waves, and that’s why they use blue color lighting to highlight the roof of the podium. How do you think about our interpretation? Our villains always went for those light causing glare, such as inground light at the steps and flood light from the event venue, and strip light shining toward the pedestrian. 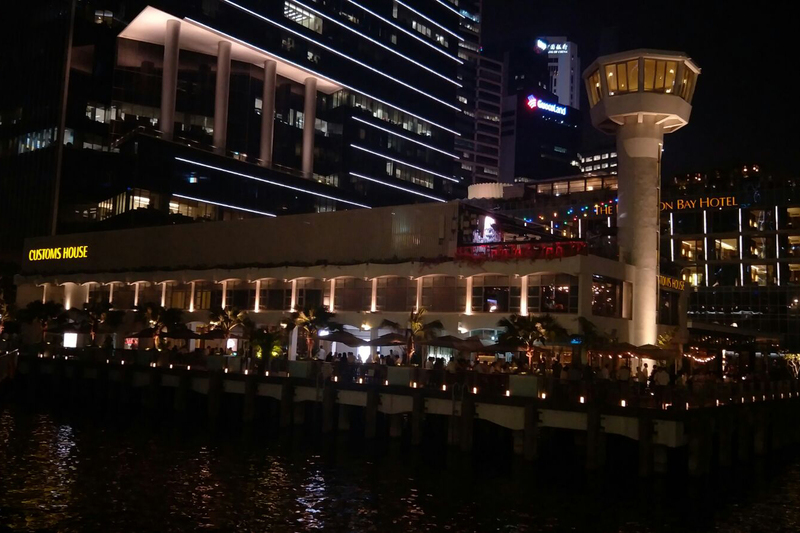 We think for those people come to Marina Bay to enjoy the nice scenery of nightscape, glare lights are really disturbing and annoying. Overall, we were very energetic and enjoyed hunting of heroes and villains, and had intensive discussions for our findings. 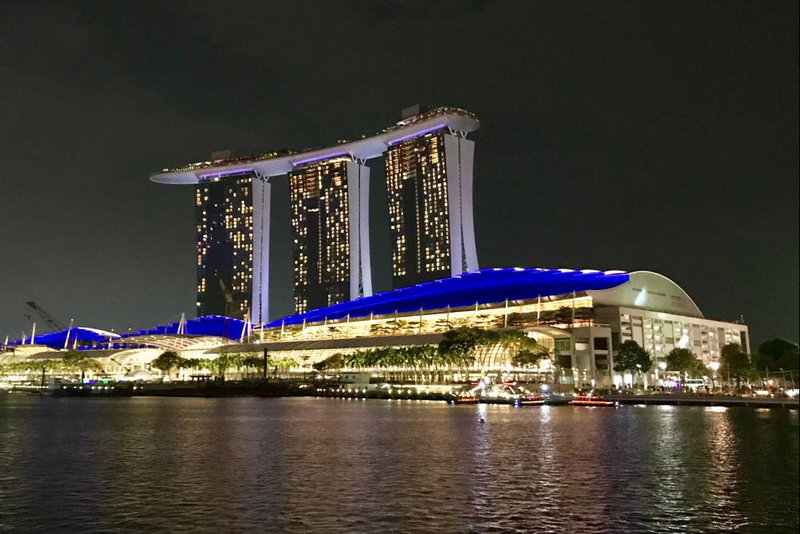 Marina bay sands hotel as a floating ship and the blue light below enhances the waves feeling. Inground light embeded in to the steps create glare. The yellow strip integrated to the bench takes out the calmness from the entire night scape. Highlighted lush palm trees were give us tropical oasis in the midst of CBD area. 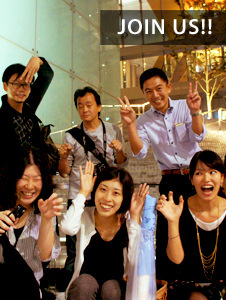 We were bunch of people who had so much interest in built environment. It was refreshing to most of the team members that lighting requires careful planning and control just like architecture to be able to achieve nicely lit environment. It did not take us long time to figure out what appears to be good and bad in terms of lighting. We picked up glowing surface bollard lights, footlights, advertisement panels as villains as they hit our eyes creating discomfort. 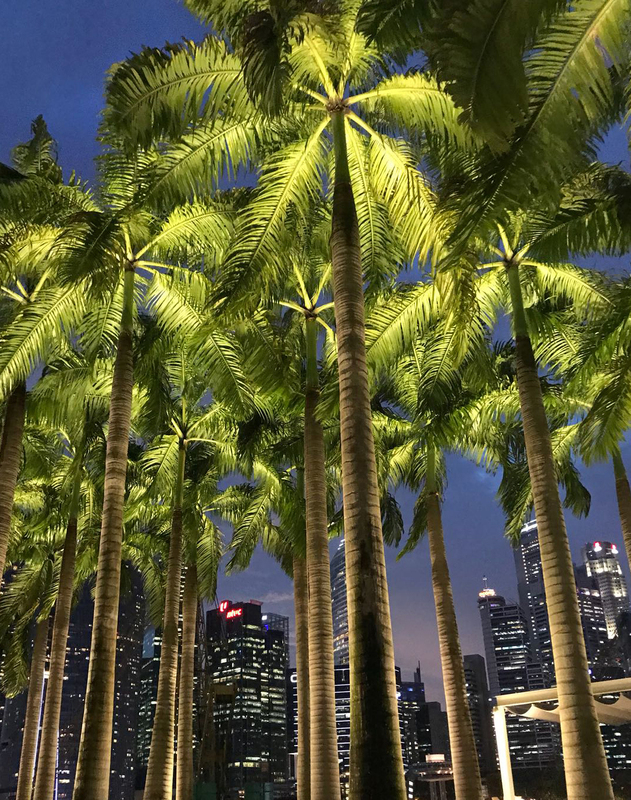 Palm trees in front of MBS were the hero to many of us as it provides pleasant feeling. We later walked inside the Fullerton Bay and imagined how we would have designed Fullerton bay interior lighting to make it better than now! 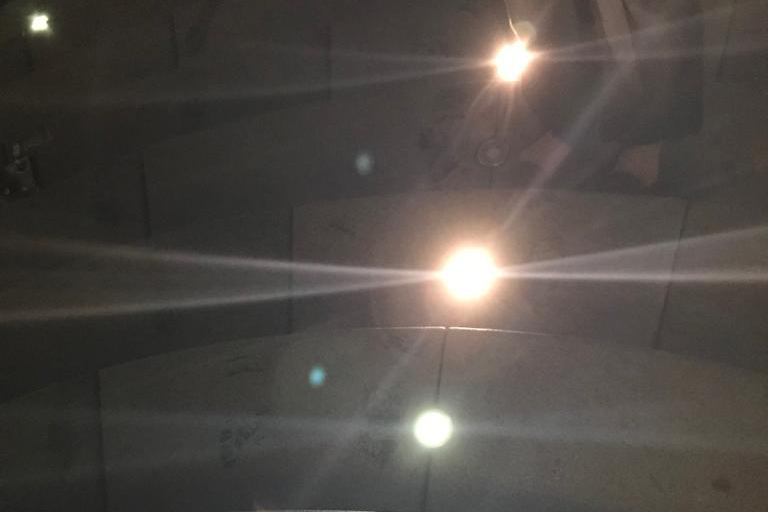 Lighting helps to bring out architectural elements. The light house guide slowly the balance subtle light on the building facade.